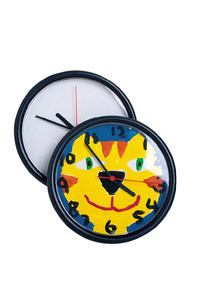 Neil Enterprises Design Your Own Clock Kit can be used to exhibit prized artwork or special photos. Clock with black outer rim includes a white die-cut insert. Own, uniquely personalized, snap-together craft clock can be decorated with pre-printed die-cut inserts or with the originally created designs or mats. Simply place an 8-1/2 in round work of art or photo over the clock face and snap in the clock hands and protective lens.